Every business is cost-conscious of its IT investments. Finding the right balance between delivering real business value and its associated cost is becoming more challenging. The emergence of new technologies has purportedly decreased the time for application development, but constant shifts in underlying application infrastructure, as well as the skills needed to develop and deploy these in more modern application paradigms, remain a serious stumbling block for many organizations. You can maximize your investment by selecting a partner with the experience, knowledge, industry expertise and efficient processes. Partnering with EGS allows you to lower your IT spend and realize a better Return on Investment. This allows you to focus more on your business, leaving the technology to EGS. 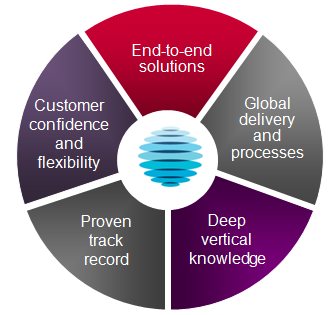 EGS works with you to understand your unique needs and requirements and then apply proven methodologies, best practices and worldwide resources to help you create a cost-effective and quality system to support your business processes and strategic direction. Our strength lies in architecture frameworks, development and managed content services for integrating unstructured content into business processes. "We not only do things right, we do the right things right"
Automation of Business Processes: From Healthcare to Manufacturing, EGS has knowledge across multiple domains and can help in handling issues, improving productivity, automating business processes and improving Return on Investment. Requirements & Business Case Analysis: EGS works closely with clients in understanding and capturing requirements, both functional and non-functional. Thorough analysis is performed in identifying gaps in the requirements and their potential risk. At EGS it is proven that the number of change requests is decreased, thereby decreasing iterations in software development and overall costs. Design & Implementation: Technology changes so rapidly that it's hard for any company to embrace it and reap the benefits. At EGS, competencies are constantly built and developed. From designing complex business-critical automated solutions to maintaining legacy applications, EGS has the right resources to meet client's goals. Re-factoring & Performance Tuning: Applications are tweaked and re-factored to the effect where EGS has witnessed several instances where the performance of the application has increased by more than 50%. Quality Assurance: EGS highly values Test Driven Development (TDD) and experienced great benefits using this approach. From Unit Testing to Performance Testing, EGS makes sure the code delivered is well tested against all the business scenarios and scalable to your future growth. Maintenance & Support: The maintenance and support of applications is not only critical but can also become costly to handle. EGS can easily help by cost effectively streamlining the whole process of maintenance and support.